Do you ever crave hot soup in the middle of July when it’s incredibly hot outside? I mean, you might be sweating just to walk outside to pick some ice cream. So what do you do when you want to enjoy the deliciousness of a creamy soup but don’t want to sweat while eating it? Make raw soup! I know, know. It sounds weird. I thought that raw soups were weird for the longest time. Until I made this Raw Broccoli Soup and became a convert. Unlike hot pureed soups that are designed for comfort – such as creamy butternut squash soup or cream of mushroom soup – raw, slightly warm soups should wake you up, taste intensely of their key ingredients, and zing with freshness. This Raw Broccoli Soup is no different and you’ll fall in love with it even if you don’t like broccoli. Sounds like a bold promise? Read on . . . Broccoli is one of those things that many people can’t handle eating. Growing up, I was no exception. I loved tomatoes, cucumbers, and sweet peas, but couldn’t stand any cruciferous vegetables, broccoli included. So if you don’t like the taste of cruciferous vegetables, there’s actually an interesting explanation why that’s the case. There are five flavors that we taste in food – sweet, salty, umami (savory), sour, and bitter. The most popular are the sweet and the salty flavors. From biological perspective, our bodies crave salt (sodium) because of its numerous life functions from the cellular level to nervous system control. Sweet flavor is associated with survival as well because sugar is our main source of fuel and energy. Savoriness, by definition, means good taste so that’s a favorite one as well. But then there is sour and bitter taste, which many people don’t like. There’s actually a really good reason for it – sour and bitter flavors alert us to foods that might be toxic or harmful. Vegetables, although very healthy, do have a component of bitterness to them. This could be from a low level of toxins created by the plant to avoid being eaten, or a kind of bitterness camouflage to make an animal think the plant is toxic. The good news is that once you understand why vegetables don’t taste good to you or your children, you can work with that knowledge to make them more appealing. I have no doubt that you’ll love this Raw Broccoli Soup even if you don’t like broccoli. It’s not hot, but it’s not cold either because the blender warms the soup up. It’s thick and creamy and nutty and very un-raw-broccoli-like. Start with whole broccoli. I know you can buy pre-chopped broccoli, but I would highly advise against it. First of all, pre-chopped broccoli has a tendency to dry out, which results in less flavor when you blend it. Second, pre-chopped broccoli usually includes only the florets and not the stems. However, since the stems have much less bite than the florets, you want to use them as well. So buy whole broccoli and chop it yourself. Also, if you can get your hands on organic broccoli, your soup will be out of this world. I know that organic food tends to be more expensive, but if you want to have the best-tasting broccoli soup, organic broccoli is the way to go. As I’ve already mentioned, the most popular flavors are salty, sweet, and savory. The best flavor for overcoming bitterness is saltiness. It also goes well with vegetables, which have natural salts in them. Salt can come in the form of pure salt, tamari, miso, or ground seaweed (such as kelp). Sweetness can’t neutralize bitterness in the same way saltiness can, but enhancing the sweet flavor can help make a dish more delicious overall. Using a small bit of sweetener is the trick Italians use to make tomato sauce so good. My favorite sweetener is maple syrup, but you can also use raw honey (if not vegan). A small amount goes a long way so be careful you don’t add too much. Savoriness adds punch and overpowers bitterness. You can think of it as a little boost of flavor. When I make this broccoli soup, I like to add a bit of miso or even steep some dried kombu to make stock and use it instead of just plain filtered water. These umami boosters are instant flavor game-changers. Next ingredient are avocados. Avocados lend the same creamy texture and unctuous richness without the use of any diary. Avocados are rich, buttery, creamy, and even slightly sweet if you use them in this recipe. You can use avocados to create creamy dishes where you’d normally reach for butter, milk, or even cream. And just in case you’re wondering, you really can’t taste the avocados at all. To make this soup even more creamy, I use cashews. It’s amazing how a swirl of vegan cashew cream can transform this soup into a dreamy wonderland of goodness. I consider cashew cream one of secret vegan ingredients everyone should know of. Cashews are not only rich and creamy, but they also add a hint of natural sweetness. Blending works wonders for hiding the taste of bitter vegetables. I would highly recommend using high-speed blender as opposed to just a regular blender or even an immersion blender. The goal is to not only achieve smooth and creamy texture, but also heat up the soup slightly. 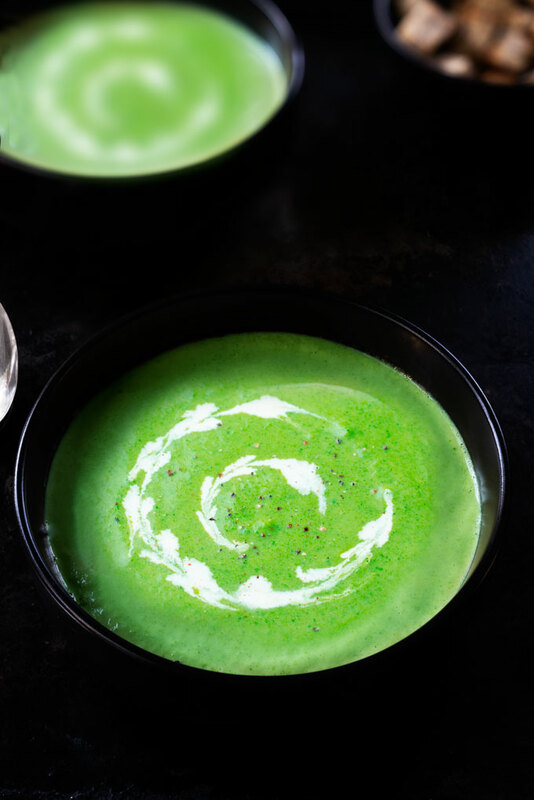 This Raw Broccoli Soup is thick, creamy, nutty and very un-raw-broccoli-like. It's honestly the best cream of broccoli soup I've ever had. Add all the cashew cream ingredients into a blender. Blend on the highest setting until completely smooth. Season to taste. Set 1/2 cup of the cream aside and leave the rest in the blender. Blend all the ingredients together with the remaining cashew cream. Blend on the highest setting until completely smooth. Season to taste. To serve, pour the soup into bowls. Add a few spoonfuls of the set aside cashew cream and swirl it into the soup. Sprinkle with freshly ground black pepper and a few leaves of parsley. Serve warm, straight from the blender. Store leftover soup covered in the refrigerator for a few days, though best within the first 24-48 hours. *Nutritional yeast adds cheesiness to this soup. However, it's not raw so leave it out if you're going for 100% raw soup. **Soak the cashews in water for at least 8 hours (or overnight) so they soften up and are easy to blend. To quick-soak cashews, pour boiling hot water over the cashews and soak for 1 hour uncovered. When the cashews are done soaking, drain the water and rinse the cashews thoroughly. (Note: if you do the quick soak, the soup will no longer be raw). This recipe has been adapted from Alissa Cohen's cookbook Living on Live Food. Soup is good. Would recommend using 1/2 garlic clove instead. What is the crouton-looking item next to the soup? Hi elaine – it’s sourdough bread that I make at home 🙂 I haven’t shared a recipe for this bread on my website because it’s not gluten-free (and I try to focus on gluten-free recipes). Hi Patila – I would just let the broccoli thaw on the counter … or sure, you can totally boil the broccoli 🙂 It doesn’t have to be raw. This cashew cream is now a staple in my fridge. Im dreaming up new ways to use it all the time. I use it to make penne a la vodka, creamy base in veggie soup, I also substituted asparagus in place broccoli. Delicious stuff! I just got a new Vitamix and I’m constantly on the look for new ways to use it. This soup has me super eager to get a head of broccoli tomorrow morning at the market! Thank you for your beautiful, informative and heartfelt content. Sending love from Italy!